The spinifex hopping mouse (Notomys alexis), inhabits the central and western Australian arid zones, living in both spinifex-covered sand flats and sand dunes, and loamy mulga and melaleuca flats. We would mostly see them at night, bounding quickly across open ground or the road on their big hind feet, tails extended behind and the body almost horizontal. There are about 10 different Australian native mice in the genus Notomys. They are all rodents, and not marsupials, and their ancestors are thought to have arrived from Asia some 5 million years ago. Like many of our Central desert mammals they can survive without drinking water. 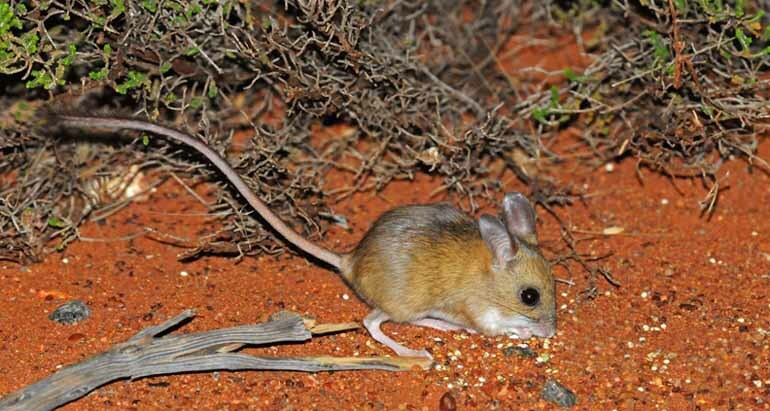 The Spinifex Hopping Mouse has very effective kidneys which absorb every drop of water from their waste. It has the most concentrated urine of any mammal ever recorded in the entire world! The mice’s diet consists of seeds, roots, green shoots and invertebrates. 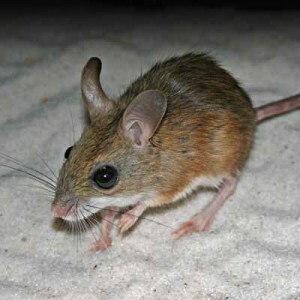 The Spinifex Hopping-mouse has a light brown fur with a grey-white belly. It has large ears and a long, brush-tipped tail that is 13–15 cm (5-6 inches) long. The population fluctuates greatly and in normal years it is sparsely distributed and confined to sandy country; after rain the population explodes and spreads to other types of habitat for a while. The image in the header was taken by Margarita Steinhard from The Wildlife Diaries.